Difficulty: (YDS) class 4 - French: PD. To the (SAC) Fridolin Hütte: A small and steep farmers road continues uphill and into the higher part of the valley. This road is closed for general traffic, however the farmer and some traffic related to a hydro electric facility is permitted. 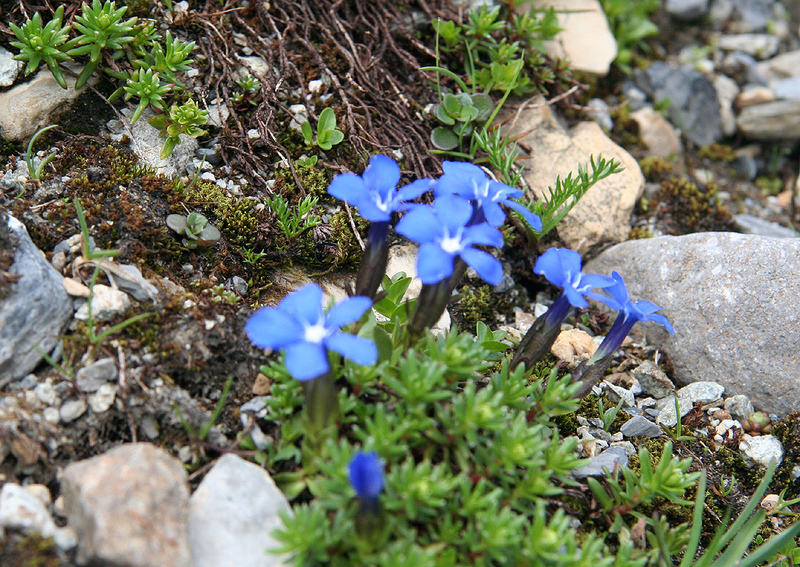 There is a sign at the beginning of the road saying Fridolin Hütte 4.5 hours. The road is nice as it winds its way into the upper valley. First, the valley is narrow with room for road and river, later it widens and ends in quite a large basin. You will pass a house on your right, then cross a local hill and descend slightly to some older farm buildings. There are signs for the Fridolin hut, the trail goes straight left up the field. It may be a bit fuzzy in the very beginning, but very clear and easy to follow just slightly higher on the slope. The trail continues in zig-zags up this slope. The main river is further right, but near the end of the slope you cross the river on a nice bridge as it runs in a deep, but narrow gorge. The trail now enters a new section of the valley, fairly flat with grass for sheep to feed. The left side is guarded by an impressive rock wall. 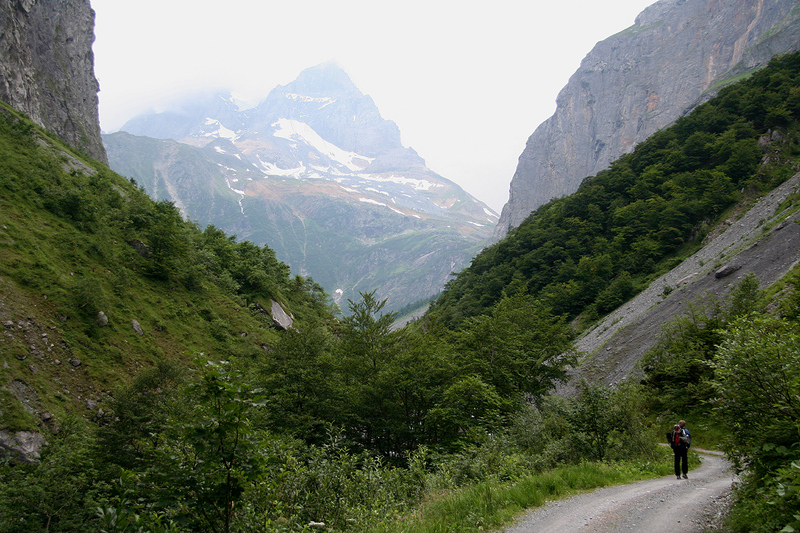 The route will continue steeply uphill, climbing the slopes on your right hand side. The trail is still well marked and easy to follow. Gaining the plateau above, you will soon see the Fridolin hut located in a very nice spot with green grass and local birds, commanding a nice view in a rough and wild environment. 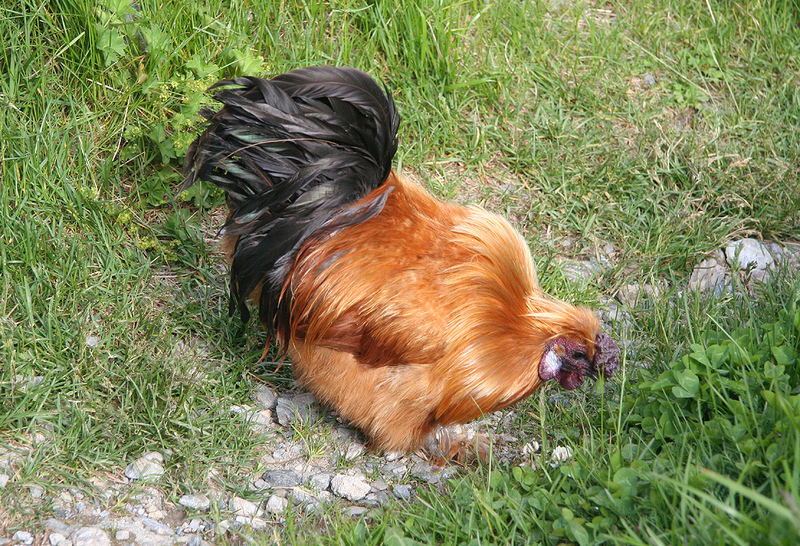 This location is N46:49.285, E008:57.012, elevation 2116 meter. 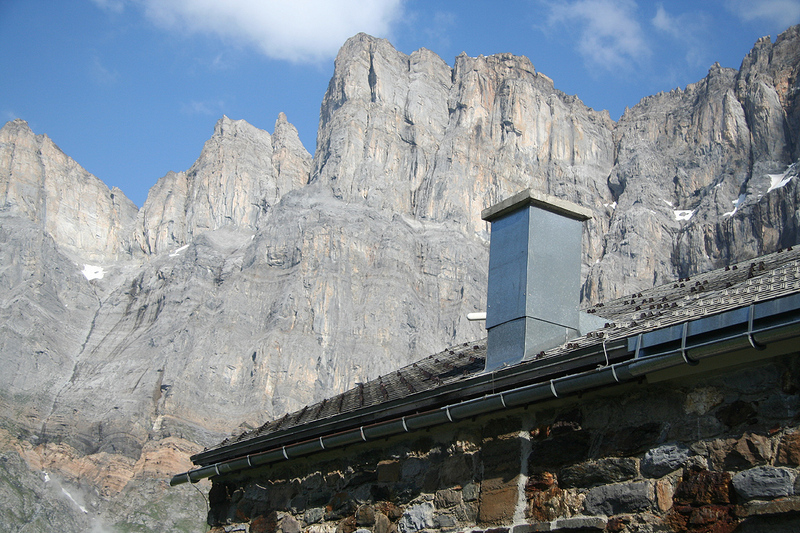 You can call the Fridolin hut by phone: +41-(0)556433434, an information number is +41-(0)556531094. 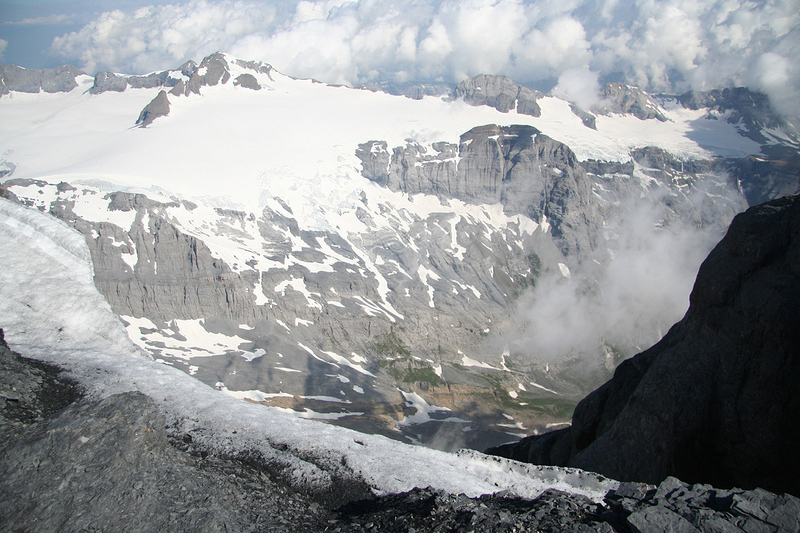 To the Summit: From the Fridolin, you can see the lower part of the Bifertenfirn glacier. 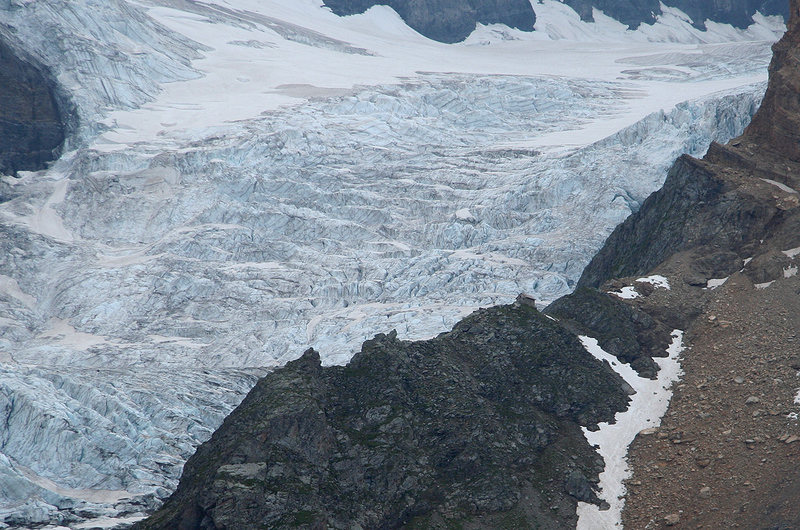 Looking carefully, it is also possible to see the old Grünhornhütte located on a small, but steep ridge very close to the glacier (up on the right hand side). The trail from the Fridolin hut to the Grünhornhütte is well marked by paint. 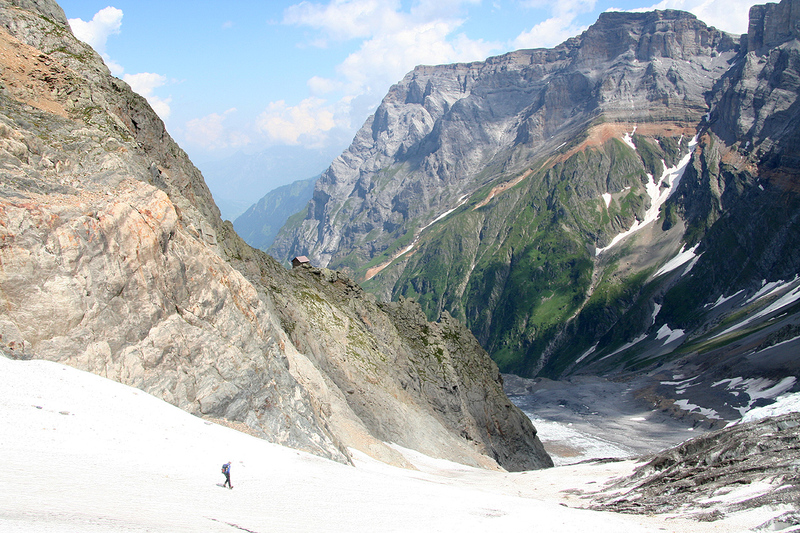 It crosses a couple of smaller creeks, as well as a few snow fields (at least early in the season), then climbs the final ridge which is followed (left to right) along its very top the last stretch to the Grünhornhütte. This part takes about one hour (possibly hiking with a light for an early start). 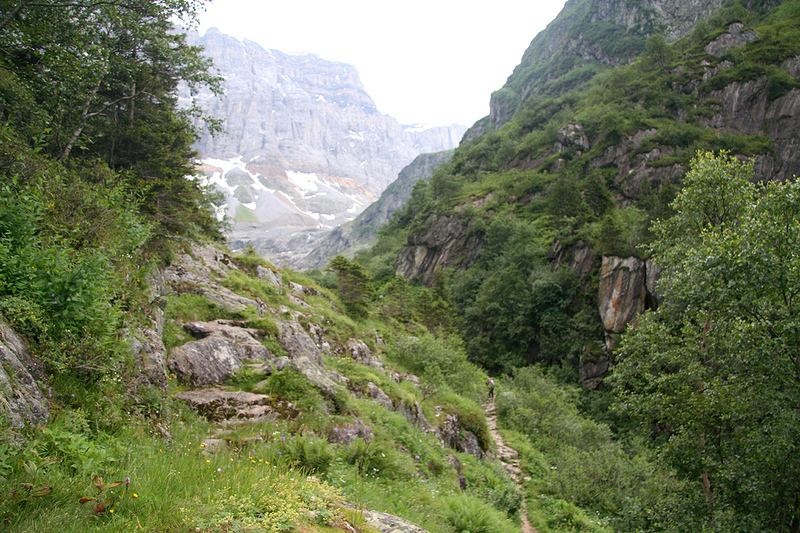 Just beyond the hut, the trail descends steeply to the glacier. There are quite a bit of loose gravel and rocks here, one should be careful if multiple people descends. The entire stretch is protected by a cable, but is no worse than YDS class 3 (rated without the cable). At the bottom, you reach a snow covered part of the glacier that can be followed easily uphill towards the steeper part of a jumbled icefall running across to your left. Straight ahead is the rock section called the Gelbe Wand (the yellow wall). Several remarks and observations are in order. 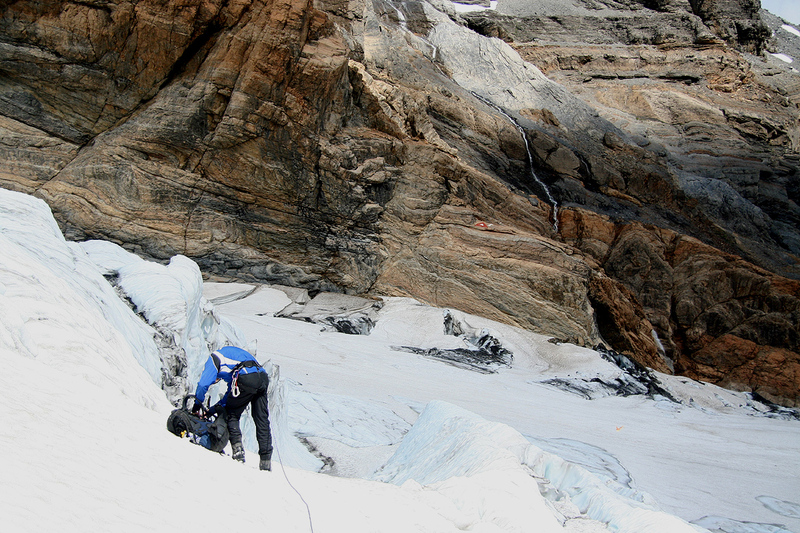 While the icefall may be stable and allow a ski ascent in the spring, it was very dangerous in July. 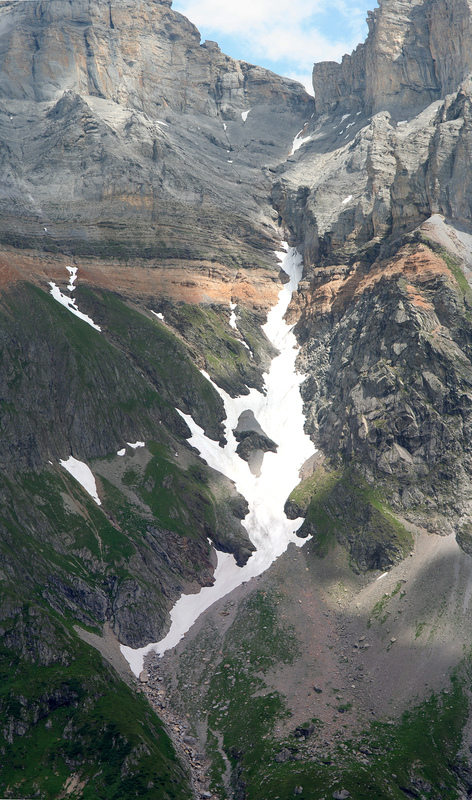 We saw two good sized blocks (small seracs) collapse and tumble down onto the left hand side (when viewed uphill) of our snowfield, essentially at the left side of the base of the Gelbe Wand. 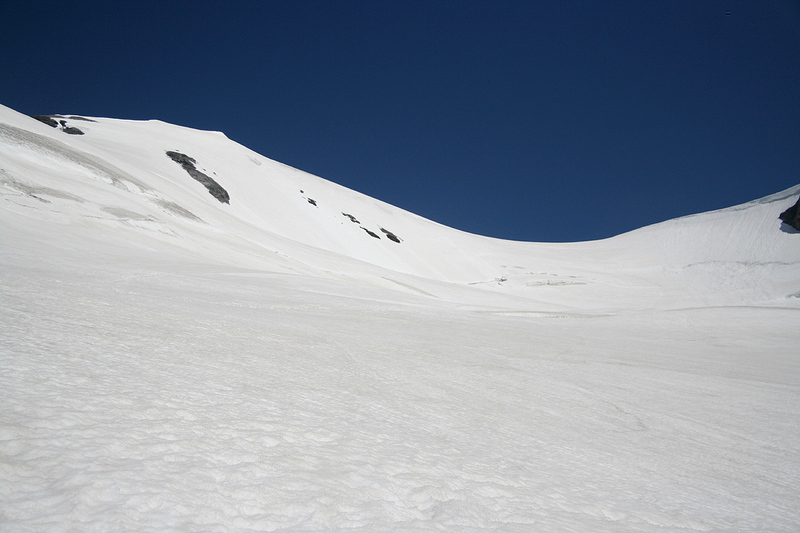 Thus, one should stay away from the left part of this small "snow valley" when coming up from below. (Last picture from descent.) On the right side of the route, one can observe quite a good number of rocks (various sizes) scattered around. Thus, there is clear evidence of rock fall danger as well. 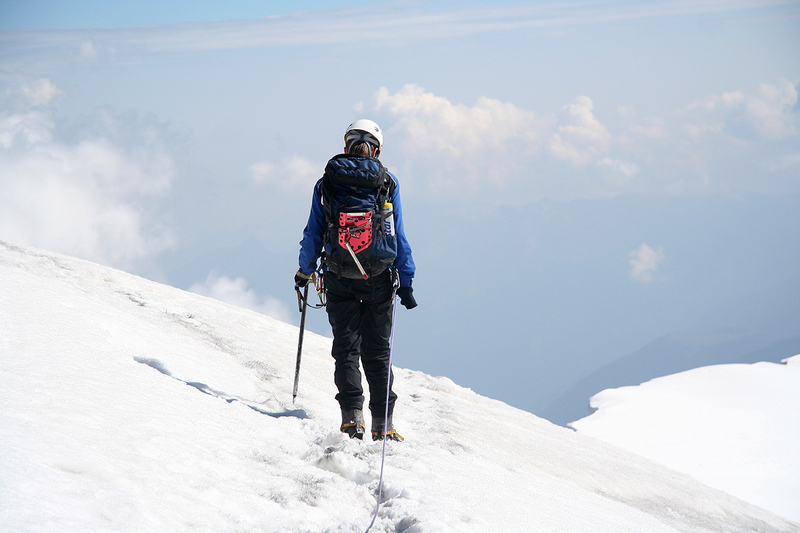 It may not be very frequent, but climbers should be very careful and aware of the danger. In conclusion, the safest route is likely to be somewhat in the middle, trying also to avoid the areas that receive most of the rocks from up right. 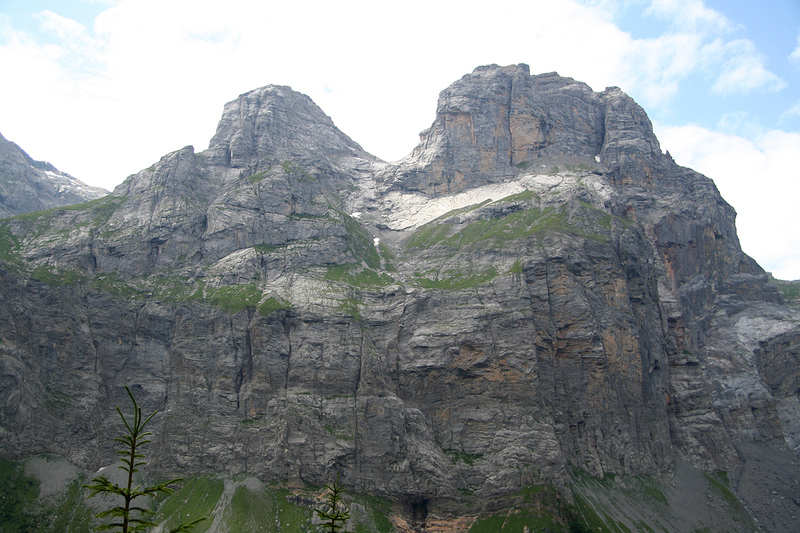 The route up the Gelbe Wand is indicated in this picture and described in the following sections. 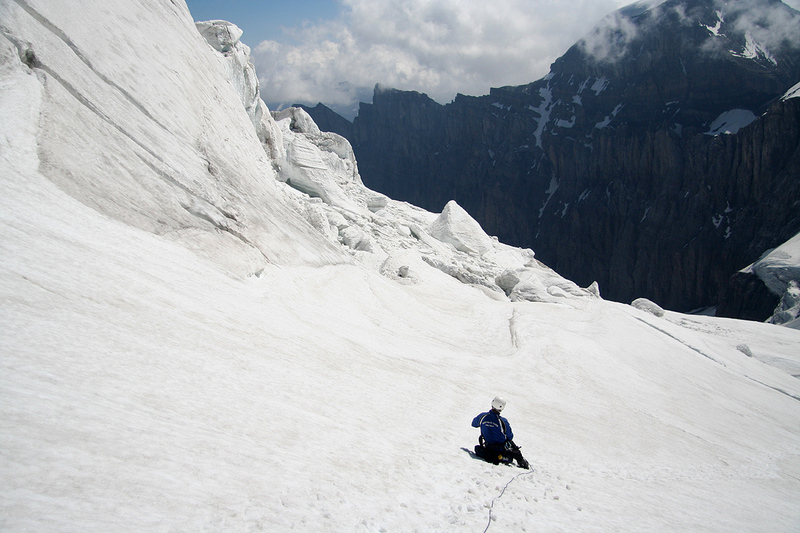 As you approach the Gelbe Wand, the snow gets steeper and (in July) is broken by a wide crevasse. 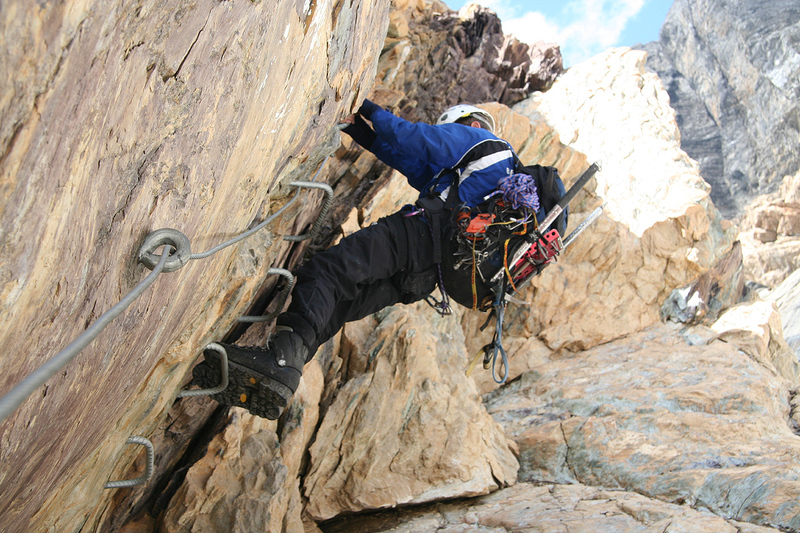 The best route does not climb this steeper snow, but crosses onto a sloping rock shelf at the base of the rock. The possible complication here is a very deep and distinct bergschrund that tends to separate the rock from the snow. It is reasonable to expect that this difficulty gets worse later in the summer. One must be careful as the snow may form narrow tounges that may collapse when attempted in order to get across. Once on the rock shelf, proceed to the right as the rock climbs gently in this direction. Without the need for much climbing you will arrive at a spot where iron steps lead directly up (to your left), overcoming a small overhang. Climb these steps in order to gain a new shelf that can be followed further left. In this way, you gain the lower end of a new sloping rock area that can be ascended (no climbing) until gaining a spot from where a narrow trail (with some exposure), again runs left and turns the main corner accessing the top of the cliff separating you from the glacier. 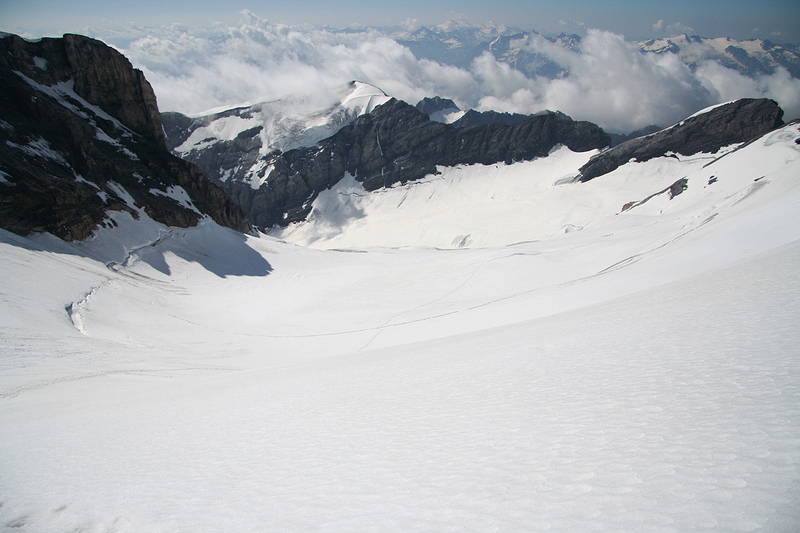 (On the previous picture, notice the snowfield running up the middle, once down one should traverse directly out there.) 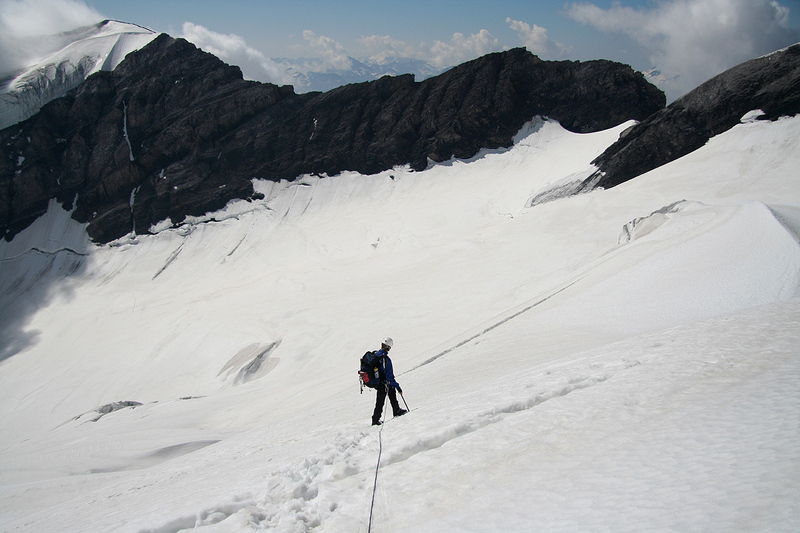 You are now about 15 meter above the glacier and a final downclimb is required. Move out on sloping rock and then to your right. The route is fairly easy, but protecting this stretch by a rope using running belays may be quite reasonable. 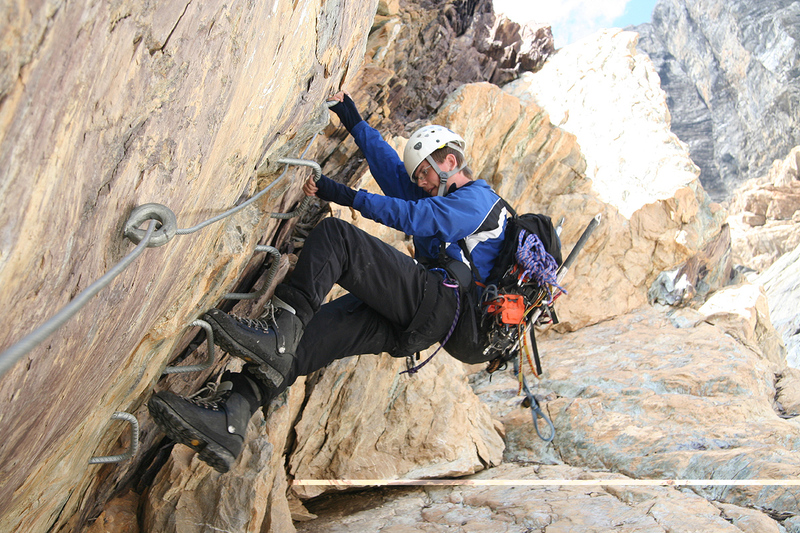 There are several bolts and points along this route that can be used as anchors for a rope. 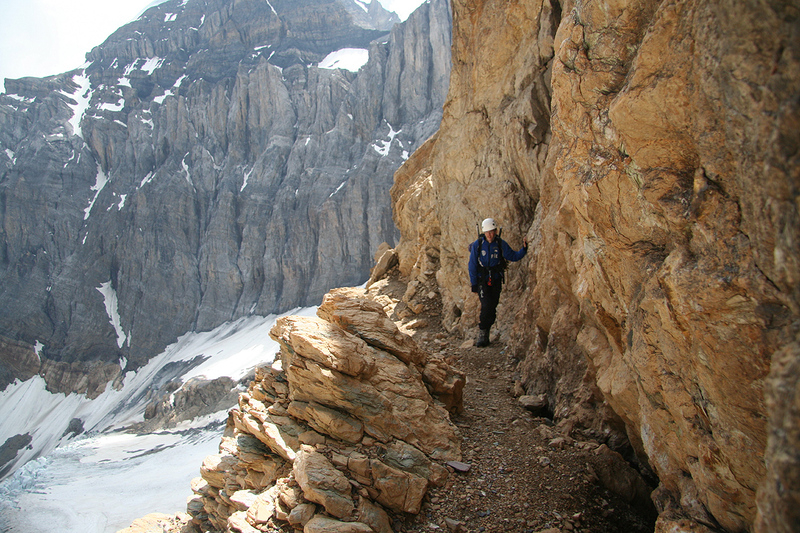 The downclimb will leave you in a fairly wide crack between the rock and the glacier. 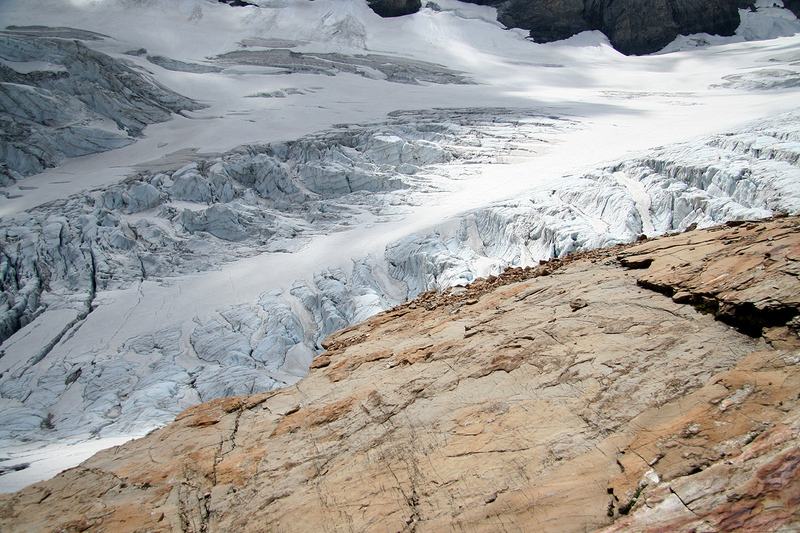 What remains is to climb out of this crack and onto the glacier surface. Hopefully, a spot where the vertical distance is (less or) about 2 meter can be located. 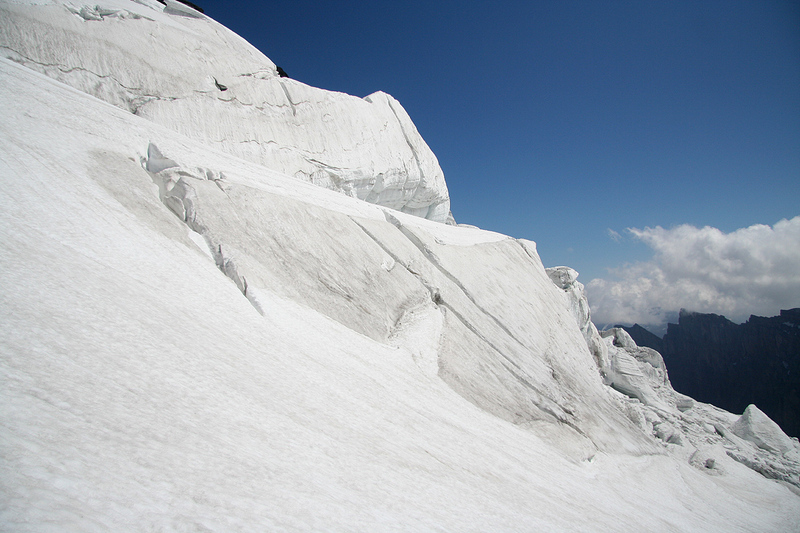 On the main glacier, traverse directly out towards the middle and locate an area where a natural route leads uphill. 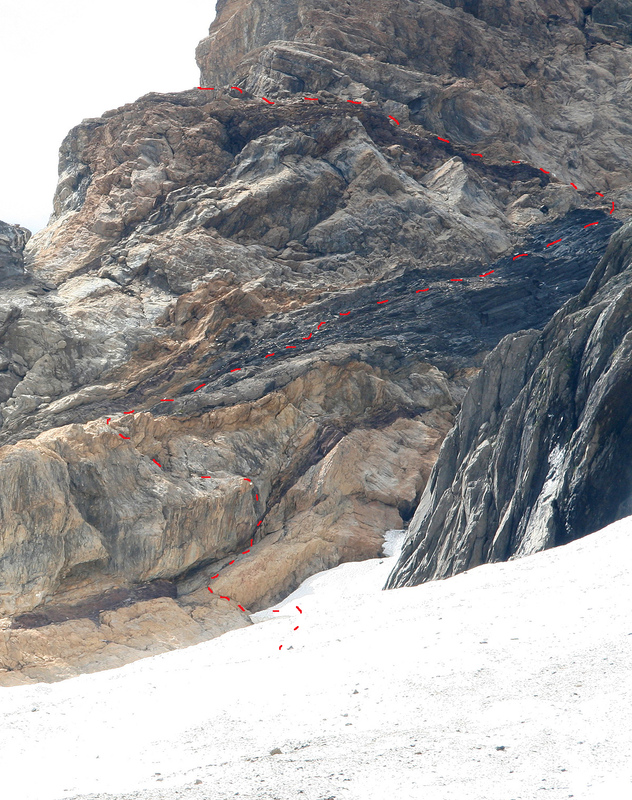 (On the previous picture, notice the big red marker on the rock guiding the correct route across the Gelbe Wand.) 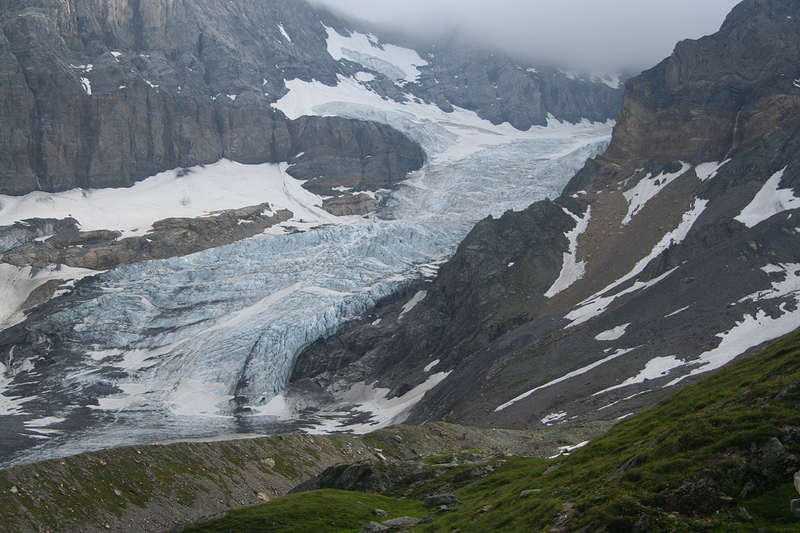 The slope here is not very steep and most likely, the glacier holds a top layer of good snow (at least through July). Higher up, the glacier slope becomes even more gentle. As you look uphill, pick a pretty obvious route more or less up the middle. In practice, this means a slight, ascending traverse going a little right, then a new stretch up the middle. Higher up, approximately at location N46:48.143, E008:55.414, elevation about 3075 meter, the route turns distinctly towards your right. 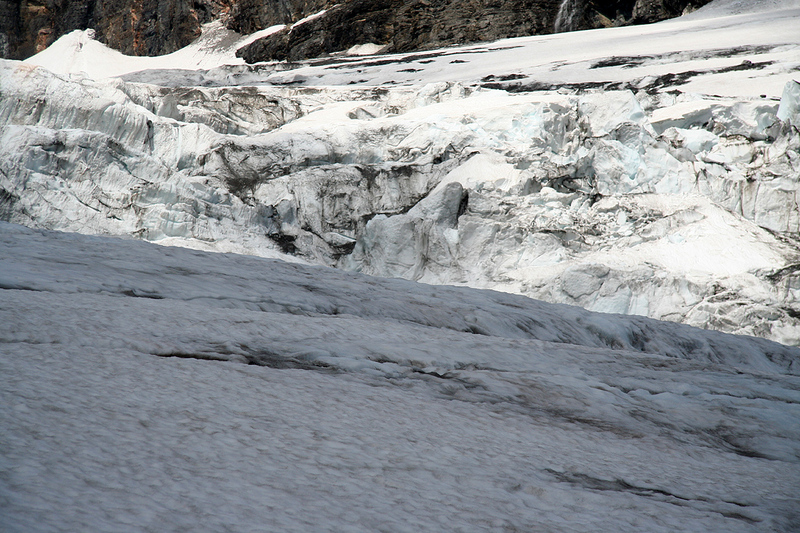 Look uphill (to the right) and observe two icefalls with broken ice. The route runs up between these, making a gradual traverse up and then more left. (See the picture, the route traverses up slightly right of middle) At this location, the route again turns more right in order to navigate around and between some pretty big crevasses. Now you will see the main summit higher up on your left while the route climbs to the clearly defined col ahead before turning left in order to complete the very last, gentle ridge. A few more steps and you will arrive at a well defined rock summit. We started out on July 15. at 1430. I had just bought the map earlier in the day and we were slightly surprised to discover that the trailhead was as low as 805 meter. This implied a net vertical gain exceeding 2800 meter, quite a bit more than for many 4000 meter peaks in the Alps. The high valley is quite nice, and we made good progress into the flat and quite wide basin that marks the end of the road. There are steep cliffs in many directions, only a few places where a trail can progress higher. As we continued up into the higher valley, we enjoyed the good weather as well as the breathtaking landscape. The rock wall that forms the left hand side is particularly impressive. We arrived at the Fridolin hut at 17:15, 2 hours and 45 minutes. It was nice to arrive at a very friendly hut with relatively few people. 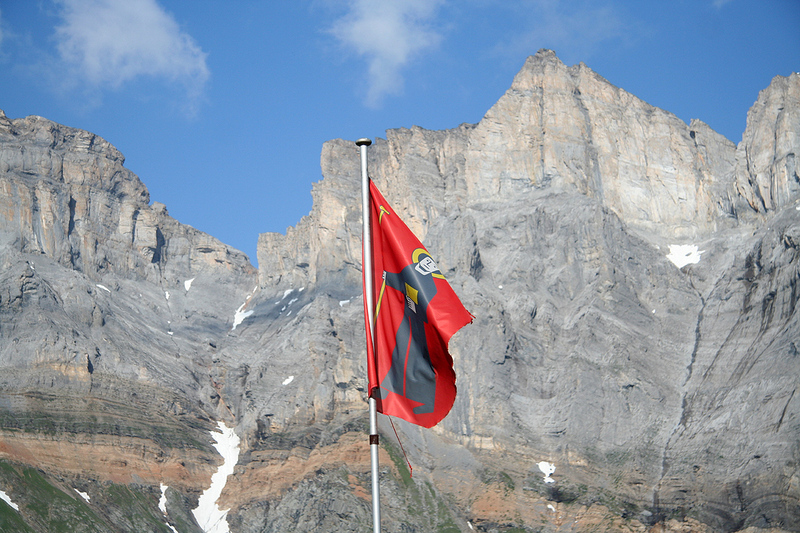 There were 6 tourists there, all doing hut-to-hut hikes, none intending to climb the Tödi mountain. The next morning, we woke up at 0315, planning a 0400 departure. The hut ladies had prepared a good breakfast for us, what an improvement over the previous huts in Italy and France! Here was real bread, Swiss müseli with milk etc. 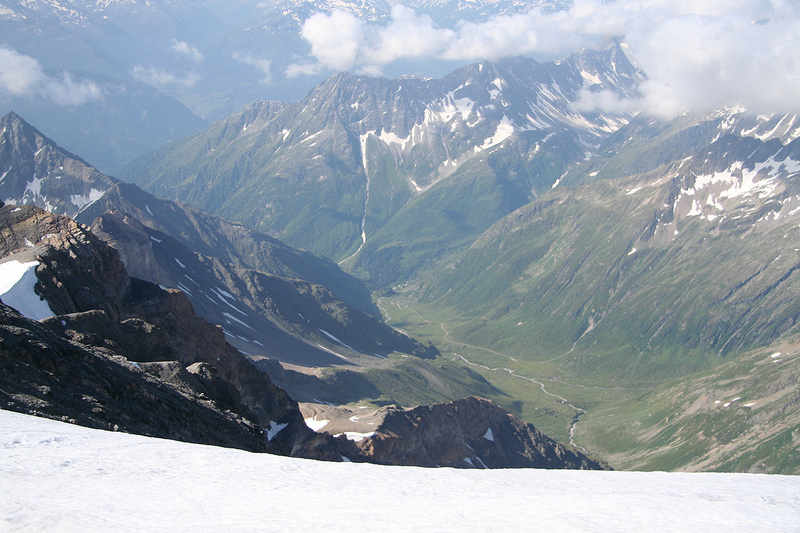 We started out along a well marked trail by 0400 and reached the old Grünhornhütte precisely at 0500. Light was coming and a short break was called for in order to put on harness and helmet. 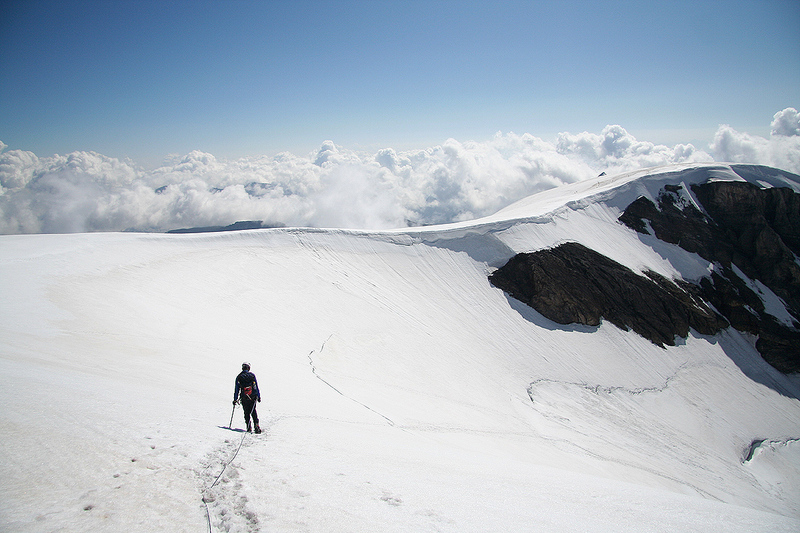 We descended to the glacier and headed uphill along the near side where the glacier has a thick snow cover. 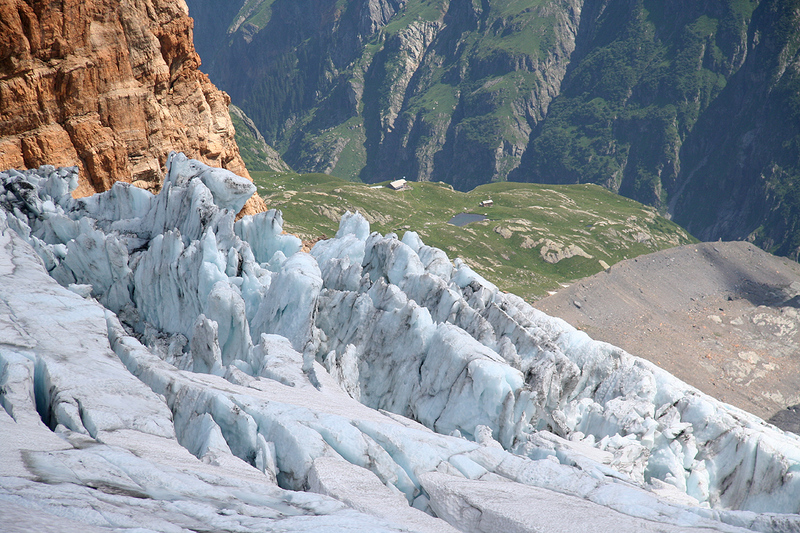 As we moved from the Grünhornhütte and down to the ice, we heard two seracs collapsing just above. Pål Jørgen spotted the second one and verified that the iceblocks fell down and broke up just below the "Gelbe Wand" not far from our route. Thus, we better stay well on the right side of this little valley-shaped area. Here, however, the snow was pretty well sprinkled by rocks falling from the very steep right hand side. Our overall conclusion was to get through this section without any undue delays. We followed the snow as it climbed into a more narrow gully only to discover that way being blocked by a crevasse like break in the snowfield. Wide enough to rule out any progress that way. 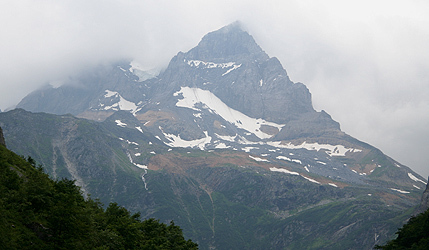 What remained was crossing from the snow to the lower rock on the Gelbe Wand. This access was troubled by a bergschrund that looked rather uninviting. We located a somewhat narrow and precarious snow tounge that almost bridged the gap and got across. The reverse manouver looked worse, but I determined that it could be safeguarded by a rappel. We followed the rock shelf carefully upwards and became more than surprised when we located a couple of iron steps moving straight up the slightly overhanging wall above us. Obviously, a fairly new addition to the route. The alternative was likely to continue a bit higher on the shelf, then make a (hopefully) easier move back left. The route was now easy to follow as we climbed higher, then made another traverse back left, gaining the main rock ridge quite a bit higher than the glacier below. What remained was a downclimb. 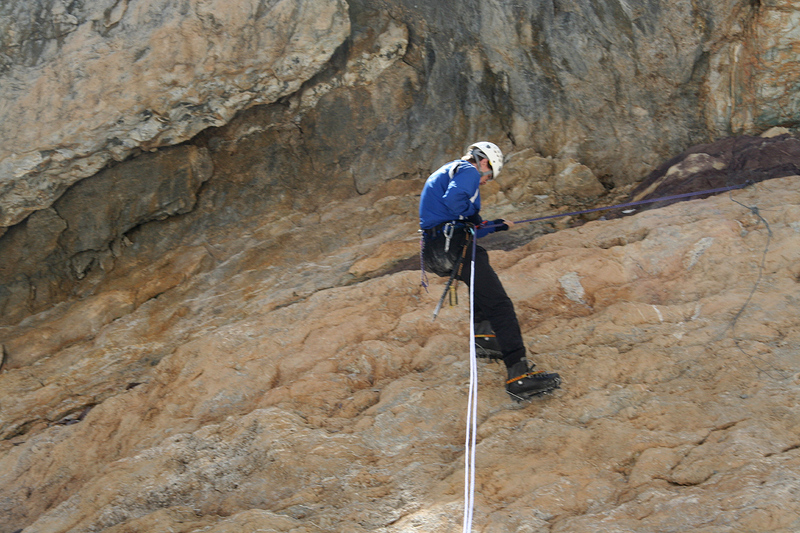 We safeguarded this with the rope, there were several belaypoints along the route. Overall, this descent was easier than our initial (incomplete) assessment that called for a rappel. We were now in a trench between the glacier and the rock, what remained was about a 2 meter vertical ice wall in order to get back out on the glacier. Crampons on. By making one, high step into the vertical ice wall and using the axe to get a secure hold on the flat ice beyond the edge, this move was not a big deal. It seemed slightly more interesting to reverse the move, but this would not be before much later. It was tempting to walk uphill on the glacier covered by snow, however, this route was clearly subject to dangers from seracs above. Better then, to traverse on blue ice, actually in some sort of natural, transverse "gully" directly out to the middle section of the glacier. My guess was that we would find an acceptable slope and good snow cover once we were out there. This turned out to be accurate. We now had a long uphill hike on this glacier. Higher up, it looked like one should continue straight, however the route turns right and ascends a steeper section of the glacier between two areas full of crevasses and seracs. 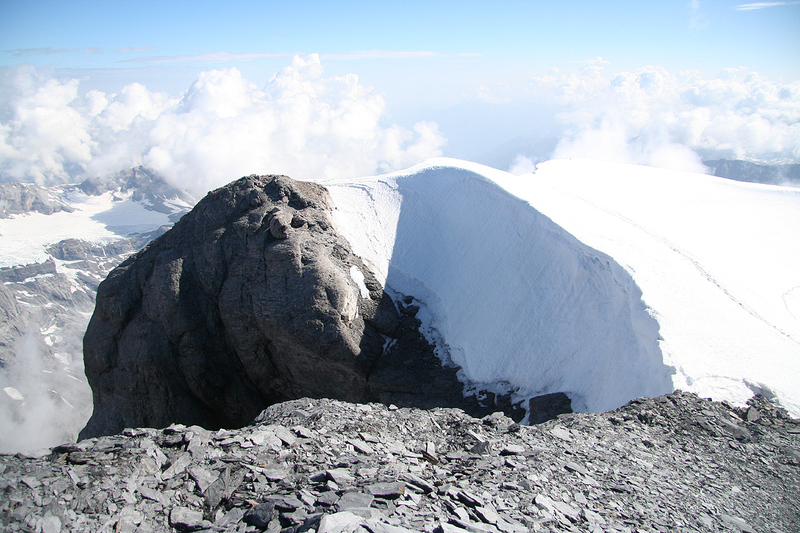 Gradually, we got the main summit, called Piz Russein, into view up on our left hand side. Big crevasses forces the route to go left, then right before ascending to the col from where a short and easy ridge will take you to the summit. 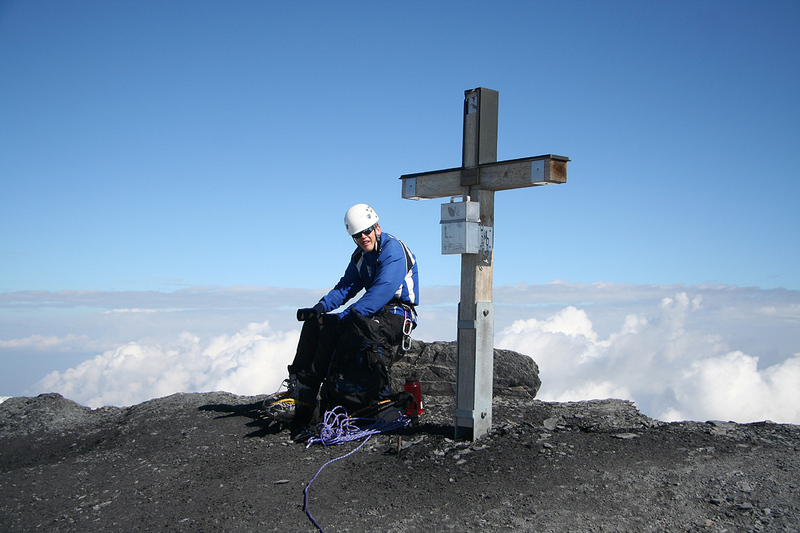 We arrived at the summit cross, nicely equipped with a mailbox holding a summit register, at 0940. This mountain had a nice summit plateau, moderate size, with a huge drop on the opposite side of the cross. We had a slight wind that reminded us about being 3600 meter high. 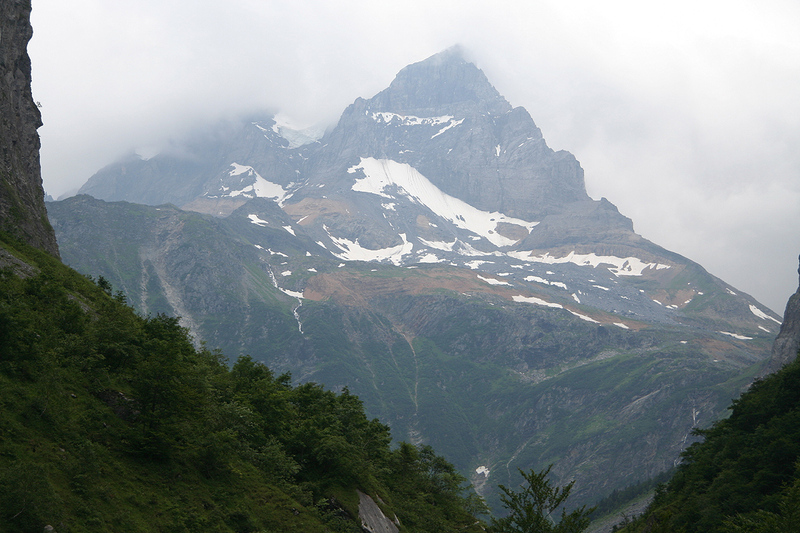 Directly across from our route of ascent is the second highest point on the mountain, Glarner at 3574 meter. The baking heat further down at the glacier did not reach up here. We had lunch, bread and salami plus water from the bottle. Still, by 1000 it was time to leave, we agreed to make another rest as soon as we were back down in a less windy and more warm location. Descending on this type of slope is far easier than ascending. 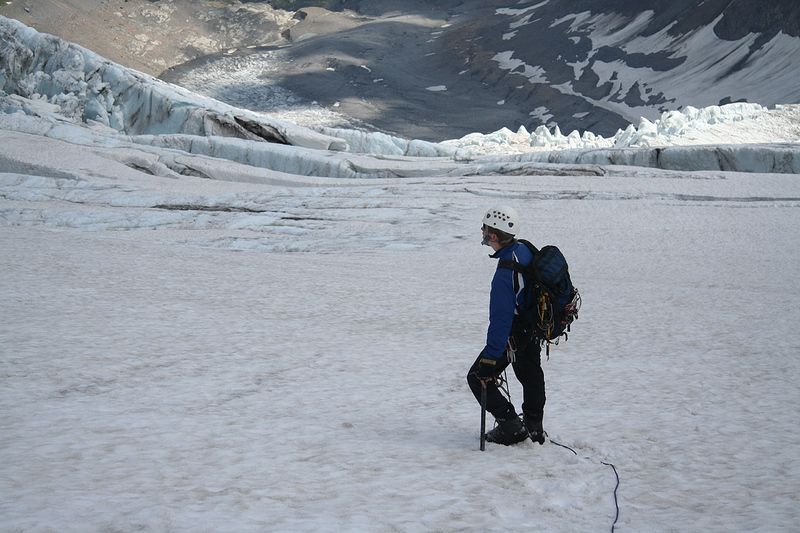 Pål's crampons would snowball and it was better for him to walk without them. Mine behaved better and were kept on. In this way, we came back down to the lower part of the glacier without any trouble. 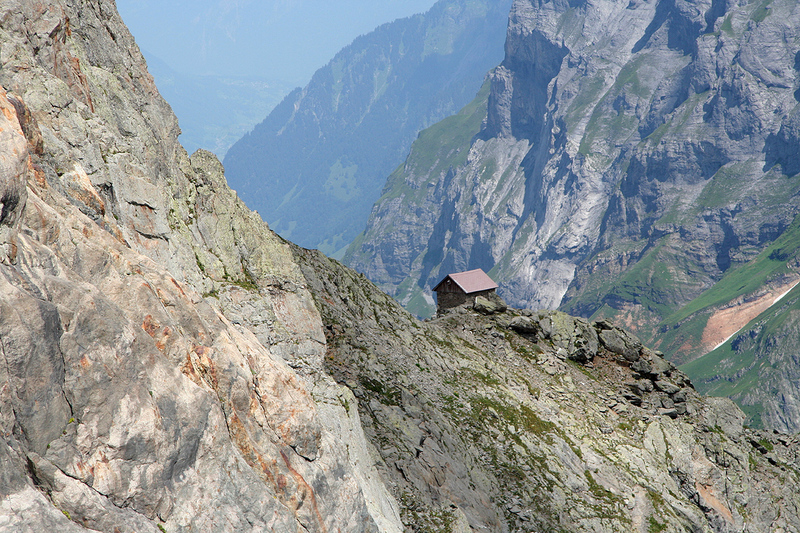 The weather was still nice and we had a good view down to the Fridolin hut. 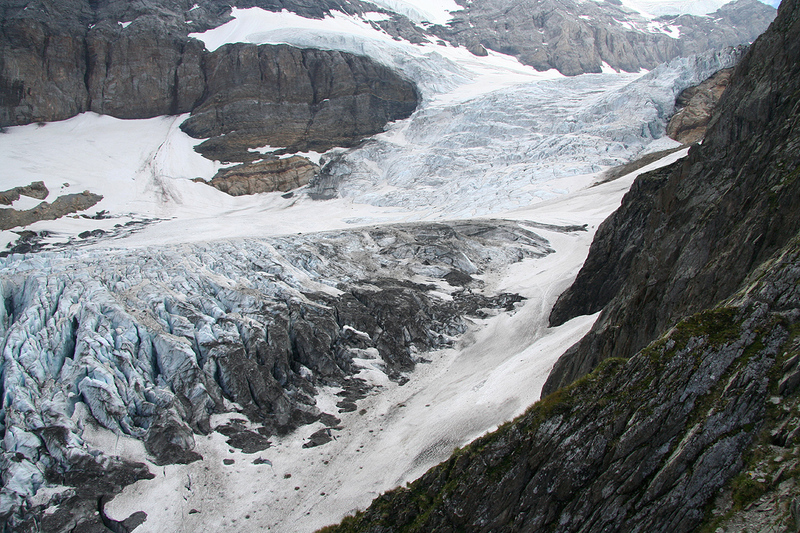 The icefall next to the Gelbe Wand looked even more unstable than earlier in the morning. We secured the downclimb from the yellow wall (gelbe wand) across the bergschrund by a short rappel, thus leaving a sling and a carabiner behind. Back at the old Grünhornhütte by 1300, a short rest was called for. The sunshine reflecting off dry rock crowned by ice provided a memorable backdrop. Back at Fridolin by 1345, about two hours faster than our ascent. We enjoyed cold drinks and the nice sun at Fridolin until 1430. A couple of locals were looking across to the steep rock wall with a pair of binoculars. I asked them if they watched somebody climb, and got a somewhat surprising reply from the young girl that worked as assistant caretaker of the hut: "That is my grandfather and he is coming here to see me" Oh Boy, I asked her his age and borrowed the binocular to see where he was. He was 67 years old and right then carefully descending steep snow among the cliffs right across. 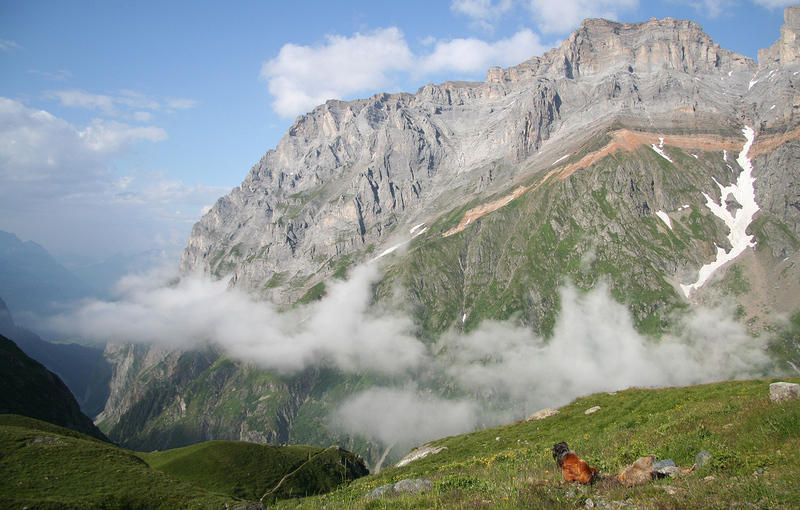 ("Grandpa" cannot easily be seen in the picture, but he is located near the horizontal rock band.) The route he was about to complete was not an easy one, but he had climbed in these mountains since being a boy. We left and made it down to the end of the 4WD, private dirt road in one hour of fast walking. It turned out that the lady that worked as a hut guardian was also headed to the village and she offered us a ride down the last stretch in her jeep. Thus, we arrived a bit earlier than expected, caught the funicular up to Braunwald (where we had established our family base camp), and finished the trip at 1600. The swimming pool was next for my pretty tired legs. 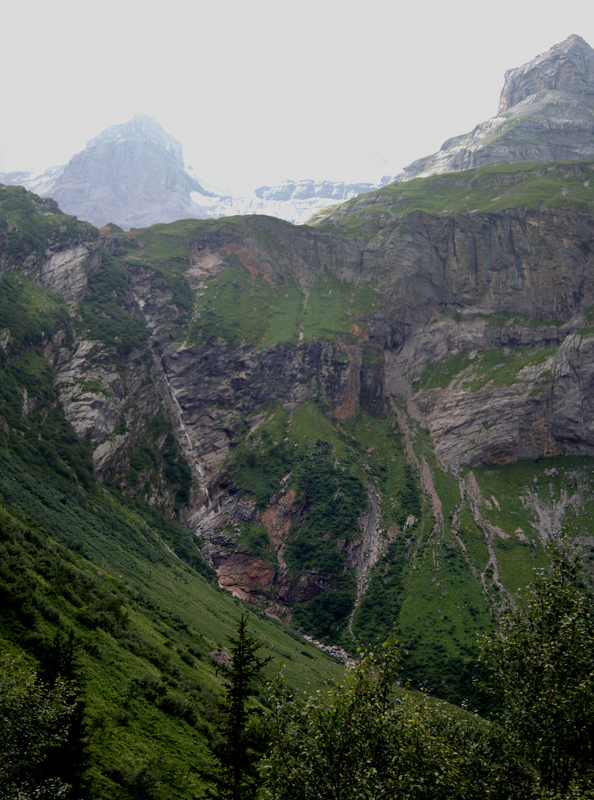 Tödi, as seen from the first part of the hike. The highest peak is further back. 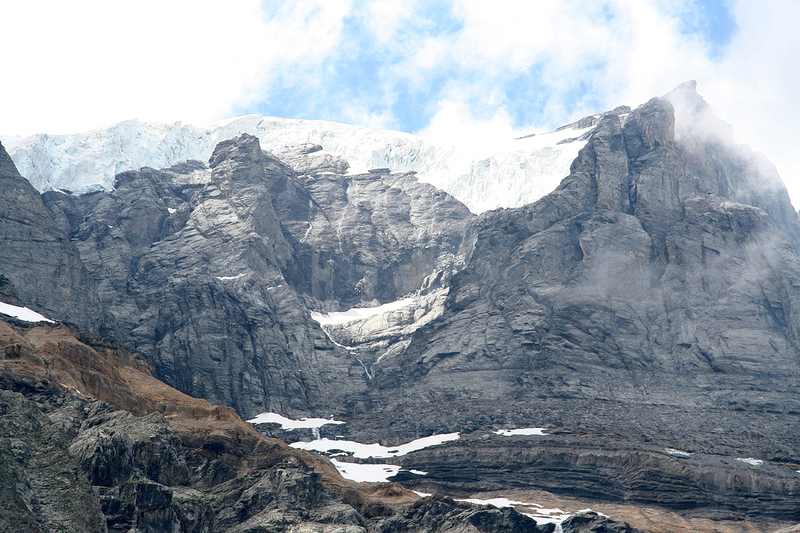 The upper part of the glacier, looking downslope from near the col. 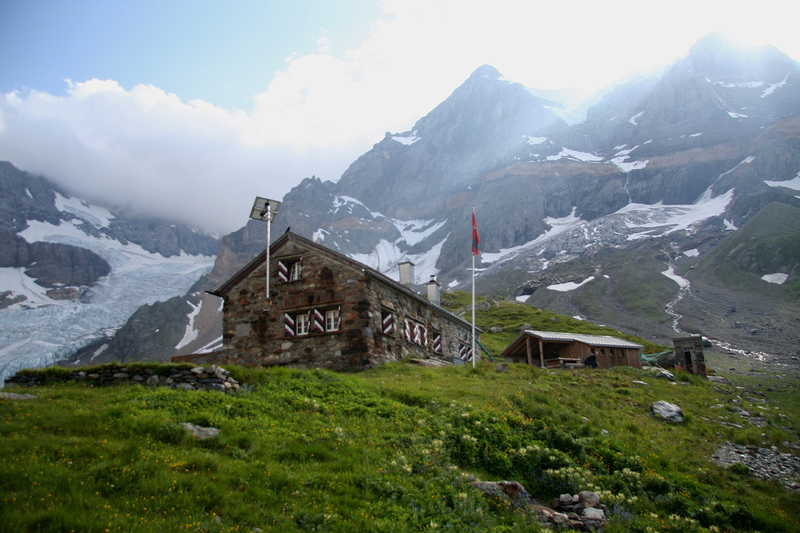 The oldest mountain hut in Switzerland, the Grünhornhütte, built in 1863. 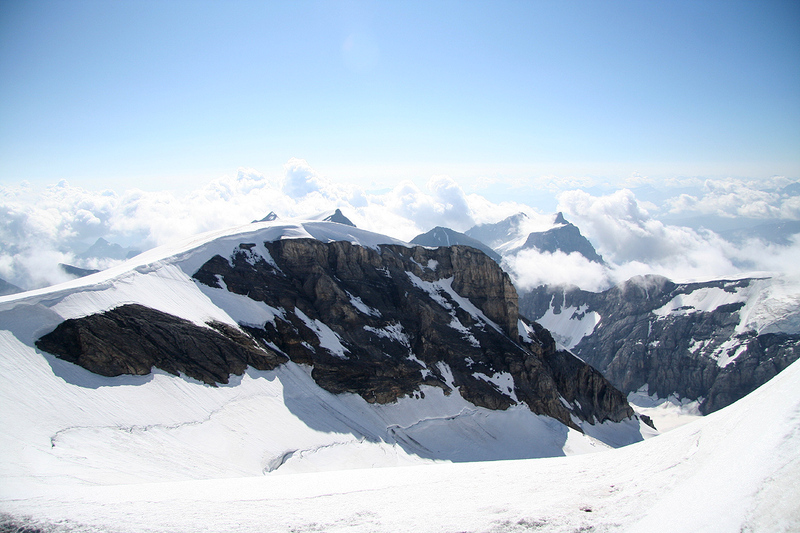 Summit view south, to Val Russein. 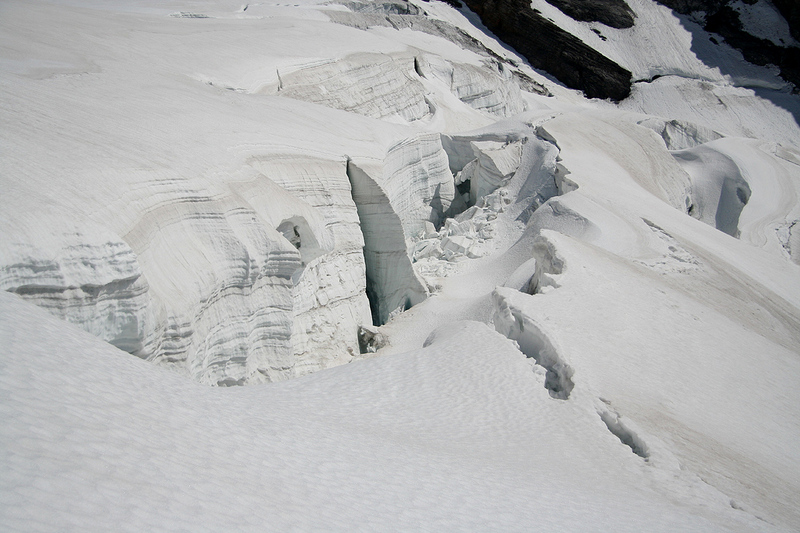 Descending the upper part, the route crosses some minor crevasses.